The Democracy and Media Foundation has a Supervisory board and a statutory board/director, statutair bestuurder/directeur, ms. N.R. Venema. The director has the ultimate responsibility for the policy and realisation of the foundation’s objectives. Members of the Supervisory Board of the Democracy and Media Foundation receive a compensation in accordance with the sector, per meeting. Furthermore, for further activities outside of the supervisory responsibilities compensation for made expenses can be requested. The director and employees of the Democracy and Media foundation receive a salary in accordance with the sector. An description of the objective and mission of the Democracy and Media Foundation can be found here. The Democracy and Media Foundation grants financial support to projects, organisations or individuals that contribute to the realisation of her objectives. This could pertain to publications, lectures, documentaries, exhibitions or training programs for journalists. This support can persist of a subsidy, a loan or another form of investment. Besides the regular grant policy, the foundation is open to collaboration with organisations and initiatives outside of the Netherlands, whose objectives fit those of the foundation. For instance, the foundation is one of the initiators of the European Press Prize, a European prize for quality journalism that was launched in 2012. The foundation’s policy is recalibrated on a regular basis to be able to respons to current events or developments. 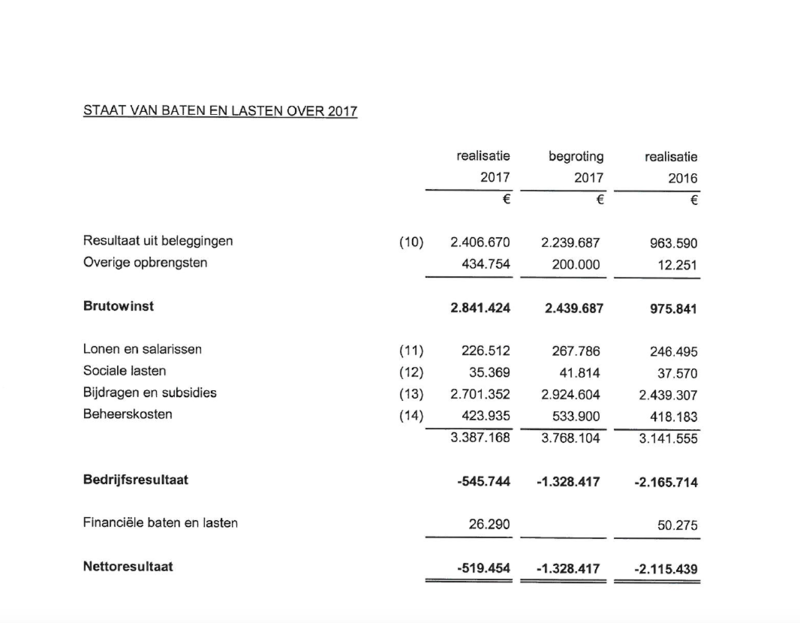 For the year 2018 the Democracy and Media Foundation has budgeted an amount of €2.000.000,- for granting financial support to projects, organisations and individuals that carry out her objectives. This excludes the office- and administrative costs for the office itself, budgeted at €800.000,-. Furthermore, it also excludes $500.000,- granted to the Media Development Investment Fund, part of a multi-annual grant (2015-2021) which adds up to a total of $3.500.000,-. The granting percentage in 2017 was low; merely 18,65 percent of the proposed projects received financing. Due to an increase in the amount of proposals this percentage has decreased further in the last couple of years, presumably (among others) because of the increased visibility of DMF. In 2016 the percentage was 27,5 and in 2015 it was 34. Here you can find a list of initiatives and organisations that have received financial support from the Democracy and Media Foundation in 2017. The list for 2016 can be downloaded here. The Democracy and Media Foundation has drafted a governance code, which has been underlined and signed by the Supervisory Board and the director. In addition to these statutes, this code indicates ways in which the director and the Supervisory Board should function. The code also contains regulations regarding conflicts of interest, that states that the director or the Supervisory Board will not participate in the discussion and decision making regarding topics in which they might have a conflict of interest. The policy of investment from the Democracy and Media Foundation is mainly focused on maintaining its the foundation’s capital. The capital gains are employed to realise the objectives of the foundation. Depending on the gains, the investment budget might vary on a yearly basis. If the results disappoint, the Democracy and Media Foundation is willing to (temporarily) eat into her capital, to be able to keep realising her objectives. The capital of the Democracy and Media Foundation is managed by the asset management companiesABN AMRO MeesPierson and ASN Bank. They receive compensation in accordance to the sector. Their mandate is based on the investment stature (Beleggingsstatuut) of the foundation. The financial statements by the Democracy and Media Foundations are drafted by Kop of Munt. The financial statements are audited by Mazars Accountants. The abbreviated ‘costs and benefits’ for 2017 can be found here.